Fiction – paperback; Scribe UK; 272 pages; 2016. Review copy courtesy of the publisher. 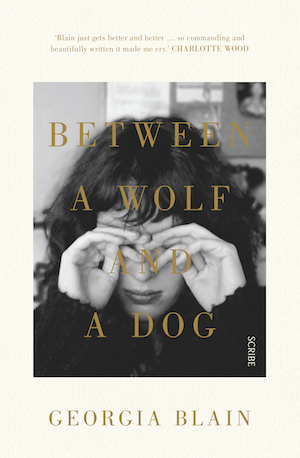 The late Georgia Blain’s last novel, Between a Wolf and a Dog, has been shortlisted for the 2017 Stella Prize. The author died in December 2016, just a few days before her mother, the broadcaster (and “Omo lady”) Anne Deveson, passed away. A domestic novel set in Sydney on a single rainy day, it is undercut with a back story (told flashback style) set three years earlier. It’s largely told from the viewpoint of Ester, a therapist, who is estranged from her older sister, April, a one-time pop star who has lost her mojo. Ester is also estranged from Lawrence, the father of her children — twin daughters Catherine and Laura — but is close to her mother, Hilary, a widowed film maker, who has decided not to tell her children she’s dying of a brain tumour. This sounds melodramatic, right? It’s not. The emotion is restrained, almost aloof, in this novel; Blain is careful to keep things in check, yet it’s full of dramatic moments. Indeed, the story is a chronicle of grief and anxiety, betrayal and strained relations — and that’s just the troubled patients that Ester listens to day in, day out in her therapy room; her own family has its own problematic, complicated past, and her ex-husband is in crisis having twiddled the numbers in his lucrative job as a pollster. I admit that I struggled with this book. Mid-way through I began to wonder if it was ever going to end. I’m not much a fan of domestic novels, though I do like explorations of the human heart — and this one does that superbly. Blain beautifully captures the stresses and strains between siblings, parents and children, and married couples. But I was never able to fully lose myself in the story because the writing, which is too self conscious, too laboured, kept getting in the way. The prose style is showy and too heavily reliant on back story (for the smallest of details) and everything is over-explained. The endless references to rain also wears thin. The strong characterisation keeps the story afloat, however, even if no one appears to be terribly likeable or worthy of sympathy. These are artistic middle-class types, affluent, secure, complacent and a little bit annoying. Blain’s perceptive eye focuses on their every day sorrows and anxieties, and questions the role of forgiveness in easing heart-ache and pain. But for much of the time, I read this book wishing I could knock a few heads together. Get over yourselves, I wanted to yell, it’s not bloody worth it! This is my fourth book for #AWW2017. It’s hard to really tell what you feel about a book after just 2 pages (which is all I’ve read of this book), but what you’ve said make sense to me & resonates with what I was struggling with & why I didn’t continue. Thanks I’ll focus on for nudging the longlisted book Offshore now. I admit this book took me two goes to get into, because, like you, I found the first couple of pages so off putting. That was last year when the book first came out. Then it got shortlisted for this prize so I thought it was time to try again. With, as you can see, mixed results. *chuckle* I liked this book better than you… as I said in comments to my review (https://anzlitlovers.com/2016/11/02/between-a-wolf-and-a-dog-by-georgia-blain/) I find Blain’s writing variable, but I liked the way she tackled the issue of assisted dying from a different standpoint, i.e. the human issues of who and how to tell. And also how forgiveness that seems impossible can take on a new urgency when there’s not much time to do it. So I’m pleased to see this book get its place in the sun, but I hope it doesn’t win, only because I think the prize – any prize – is a means of supporting an author financially to enable them to write without having to work for a while. And if she won, that would deny that opportunity to some other author who could benefit from it. Oh yes, I didn’t even mention the assisted dying in this review, did I? LOL. Agreed it was an interesting take on a controversial issue — and all the more poignant given the author’s situation at the time of writing. Also agree that it would be a waste if she won, because the prize, IMHO, should reward and recognise emerging talent. No but it’s on my shelf – I started it but had the same first impressions. It came highly recommended though so I’ll come back to it! Yes, it’s been highly recommended all over the place. I’m not sure what the fuss is about, TBH. I absolutely loved this book – devoured it. Particular enjoyed every time Hilary entered the story, as well as the stories shared by Ester’s patients. Glad to hear you enjoyed it. Am conscious I’m out of step with popular opinion on this one. Thanks for the other side to the large number of glowing reviews & awards. This is a book I’ve been thinking “shall I? Shan’t I?” For quite sometime. You’ve tipped the see-saw in the “no” camp for the time being. If it wins the Stella the see-saw may tip again!!! Agreed. Couldn’t work out why I struggled to finish this book. Rain……too much rain! !